Visit the Amazing Rombeiro Christmas Holiday House in Novato this Weekend! Other Holiday Happenings: holiday ice skating, visit with Santa Claus, North Bay Christmas Tree Farms and Lots, festive holiday teas, holidays in San Francisco, and visit Marin's Amazing Rombeiro Christmas House. Shop for special holiday gifts. There will be original artworks, crafts, jewelry, woodworks, silk scarves and more by some 35 hand-selected local artists there’s something for everyone on your holiday list. With over 700 items priced from $5 to $250. Free admission. Location: Marin Center Exhibit Hall, 10 Avenue of the Flags, San Rafael. Event details. Bring the family for this beloved Bay Area holiday tradition. ODC/Dance enlivens Margery Williams’ classic tale of a well-worn nursery rabbit that becomes real. Told though music, dance and a powerful narrative, The Velveteen Rabbit celebrates the unique relationship between a little boy and his stuffed rabbit, and the enduring power of love. Tickets range from $15 to $65. Location:701 Mission St, San Francisco. Event details. The NorCal Ice (formerly known as Marin on Ice) outdoor skating rink in San Rafael's Northgate Mall returns to offers al fresco skating. The rink will once again be located near the center's Oaktree Plaza and features 6,400 square feet of real ice. Skating costs $15 per person, which includes skate rental and all-day in-and-out privileges. "Skate Buddies" (the blue plastic chair-like supports) are available to rent for beginners ($5 per hour). Location: Northgate Mall (next to Kohls), San Rafael. Event details. Come celebrate the holiday season at Marinwood's annual WinterFest! Ticket prices include: photos with Santa, arts and crafts, face painting, bounce house, holiday treats, live music and more. Tickets: $12 in advance or at the door for kids ages 2–12 (adults are free). Location: 775 Miller Creek Road, San Rafael. Event details. Light the tree and sing holiday classics along with the Golden Gate Carolers. Light refreshments and kids activities will follow in the Presidio Community Y gymnasium. After the tree lighting, don’t miss the lantern-lit evening forest walk at 6 pm. Free. Location: 103 Montgomery Street, San Francisco. Event details. Celebrate the holidays at Oakland Zoo amidst a million glowing lights! Soar over the Oakland hills in our festively-lit gondolas and see the Bay Area skyline like never before. New this year, enjoy swirling snowfalls over a dazzling Winter Wonderland attraction featuring Santa in his decked-out workshop for the ultimate holiday experience. ZooLights is a separate event and is not included in regular Zoo Admission. $10 adults, $9 children 2–14 and seniors 65+, free for children under 2 and adults over 80. Location: 9777 Golf Links Rd, Oakland. Event details. Thousands of bright lights will shine to symbolize the lives, hopes and dreams of the community. With a $10 donation, a light can be dedicated in memory or honor of a loved one. Hospice will also send an acknowledgment card to your family and friends sharing your gift of light. Contact Hospice of Petaluma at (707) 778-6242 to name a light or for additional event details. Location: 21 Petaluma Boulevard, Petaluma. Event details. Shop with over 55 booths that include baby items, jewelry, ceramics, wreaths, ornaments, bath & body products, fresh greens, handmade items and more. Free admission. Location: 1560 Hill Road, Novato. Event details. Their home is something that truly has to be seen to be believed, and photos don't really do it justice. There are something like 140,000 lights as well as countless figurines, dioramas, and decorations adorning the front and side yards, walls, and roof of the Rombeiro house. If you think the outside is impressive, then you need to go on inside and get a healthy dose of Christmas spirit. You'll find model trains, more figurines, Christmas trees, and the biggest lighted holiday village you've ever seen. Location: 34 Devonshire Drive, off of Center Road, Novato. For more info, read about our visit here. Partake in a holiday treat as you go back in time to Victorian England and meet Charles Dickens, listen to him read from his famous works, watch his characters come alive (look out for Scrooge), meet and greet the true Father Christmas, play Victorian parlor games, dance and sing with our Victorian family and make traditional holiday crafts. Light food and drink will be served. A true family event. Tickets: adult $12 and child $9 (13 and under). Purchase tickets here. Location: 1408 Mission Avenue, San Rafael. Event details. Join us for this beloved Christmas story featuring a young boy who is welcomed aboard on a magical trip to the North Pole where he gets to make his Christmas wish. Get free hot chocolate and a cookie from our Café, and don't forget to wear your favorite cozy pajamas. Free. Location: 313 Corte Madera Town Center. Event details. 'Tis the season to celebrate with our community. Join Sonoma County farmers and producers as they open their gates and barn doors to offer a behind-the-scenes peek at life on the farm. Shop their unique farmstands for your holiday meals, cut your own Christmas tree, make a gift at DIY workshops, greet farm animals, and so much more. Free. Register online for a list of each weekend's participants. Event details. Come play in real snow at the FREE Snow Day & Hot Cocoa Stroll! Plus Horse & Carriage rides, take a selfie with Santa, Arts & Crafts, Face Painting, Balloon Twisting and More! Petaluma Fire Department will be collecting new, unwrapped toys. Location: 401 Kennilworth Drive, Petaluma. Event details. Santa and his friends are waiting for you! The elves at the Corte Madera Community Center have been hard at work preparing a very special pancake breakfast for you and your family. Santa Claus is very excited to see all his favorite families and take pictures! As many of us know, it can get a little chilly at the North Pole. Frosty the Snowman will be taking donations for the Kids Club Warm Coat and Toasty Toes Drive during the breakfast as well. Cost: $10 per person. Register online here or by calling (415) 927-5072. Enjoy a fun-filled day of festive celebrations, write a letter to Santa, Santa sing-along 9:30 am, The Grinch movie under the big tent, Whoville singers, decorate holiday cookies, a Fairy Workshop in DIESEL with Emily Butterfly, and a visit with Santa! Location: Larkspur Landing, Larkspur. Event details. Make It, Take It, Wrap It! Bring the family to this free event featuring crafts to make and purchase, live music, photos with Santa, holiday dress-up with local theatre company, cookie decorating and more! There is a wide variety of crafts to make including holiday ornaments, bead jewelry, fused-glass, clay pendants, cookie decoration, painting and holiday cards.Location: 180 Camino Alto, Mill Valley. Event details. We're gearing up for the annual bake sale! Homemade and expertly wrapped treats of all kinds will be on sale. There will be crafts for kids and, of course, pictures with Santa. Don't miss this holiday tradition. Location: 30 Sir Francis Drake Boulevard, Ross. Event details. Take a ride on our festively decorated Holiday Express Train, and bring your toy donation. Santa will be onboard collecting your unwrapped toys. Clover Sonoma Eggnog will also be served to celebrate the beginning of the Holiday Season. SMART is collecting donations of unwrapped toys and gift cards on board the Holiday Express Train and at our station kick-off celebrations. Check out our train schedule here. Event details. Santa is sending his favorite reindeer, Belle, Holly, and Peppermint, to spread holiday cheer at San Francisco Zoo & Gardens! Until January 1, majestic reindeer will be romping at SF Zoo's Playfield Lawn, near the spectacular Elinor Friend Playground. Zoo admission applies. Location: Sloat Blvd. at the Great Highway, San Francisco. Event details. Visit Santa at the Mart! Meet Santa Claus at the Mart each Saturday in December before Christmas! Be sure to bring your list to ask Santa for the present you want—and put your best smile on for the complimentary photo. Location: Larkspur Landing. Event details. Sing along with your favorite Christmas carols as the toys of St. Nicholas's workshop lead you on an extraordinary journey, filling children, young and old, with the joys of the season. Festive for families! Tickets start at $10. Purchase tickets here. Location: 1100 California Street, San Francisco. Event details. The annual Fairfax Craft Faire is held at the Pavilion in the heart of Fairfax. A wonderful selection of crafts, music and food will fill the Pavilion for this event. Location: 142 Bolinas Road, Fairfax. Event details. Join us for two vibrant days of shopping, discovery, workshops, tastings, art installations, and charitable giving. A unique and festive shopping “village” focused on the fresh voices of its Marin-based vendors and raising money for this year’s Marin-based beneficiaries: Beyond Differences, ExtraFood, and MarinCASA. Free at Dunphy Park on Bridgeway at Napa Street. Location: Larkspur Landing, Larkspur. Event details. Santa arrives by firetruck (courtesy of the Larkspur Fire Department) at Santa’s Workshop in front of Mollie Stone’s Market on the first three Saturdays of December. Free photos with Santa for families, friends and pets courtesy of CVS. Enjoy live music, sidewalk specials, Santa’s elves and children’s activities and treats. Location: 50 Bon Air Center, Greenbrae. Event details. Marin Ballet's Nutcracker production is one of the county's cultural jewels! With over 200 dancers, intricate costuming, lavish sets, and artful choreography, it's a holiday event not to miss. Meet Clara, the Nutcracker Prince, the Sugar Plum Fairy and special guest characters for photos and autographs at the Candy Cane Party following the 1 pm performances on both Saturday and Sunday. Tickets: $45 adults, $25 seniors and youth 18 and under; $10 for the Candy Cane Party. Location: 10 Avenue of the Flags, San Rafael. For more info, go to www.marinballet.org. Purchase tickets here. With a cast comprised almost entirely of children, ages six to 18, The Snow Maiden is a full-length Ballet and Character dance performance recounting a beautiful Russian folktale filled with love and magic. Come enjoy the story of Lel, the Russian shepherd boy who falls head-over-heels in love with the beautiful and mystical Snow Maiden. Perfect for all ages. Tickets: Adults $22 and Child $12. Purchase tickets here. Location: 476 First Street East, Sonoma. Event details. Join the San Francisco Lesbian/Gay Freedom Band for the 31st Annual Dance-Along Nutcracker! One of San Francisco’s most celebrated events, this year’s show The Fantastic Adventures of Captain Nutcracker is a zany superhero quest that’s perfect for the whole family. Tickets: $30 adults, $18 seniors, children, and students. Location: 701 Mission St, San Francisco. Event details. Bring the family for some fun at the historic Sonoma Square. Enjoy live music, cookies, hot cider, create a Christmas cracker or a lavender scented sachet ball. There will be a special visit from Santa. Location: 36 Spain Street, Downtown Sonoma. Event details. The 16th Annual San Francisco Parol Lantern Festival – a must-see event during the holiday season.The festival begins with a series of parol lantern-making workshops held at the Bayanihan Community Center and are still going on. Parol workshops are open to the public. Location: 750 Howard St, San Francisco. Event details. Join NatureBridge Golden Gate as we discover one of the most amazing natural phenomenon, bioluminescence. We will hike out to Rodeo Beach and explore the sands for twinkling plankton. Where did they come from? Why are they blinking? Are they here all the time? Cost: $15 per person. There is currently a waitlist, so if you're interested, please add your name to the list here. Event details. Bring the family to the Sausalito annual Lighted Boat Parade and Fireworks. Lighted boat parade starts at 6 pm and fireworks around 7:15 pm. Free to everyone along the Sausalito waterfront. Location: Sausalito Waterfront, the Big Tent by the Spinnaker Restaurant. Event details. Great Dickens Christmas Fair (see Friday for details). The Velveteen Rabbit (see Friday for details). Holiday Ice Skating in Union Square (see Friday for details). Rombeiro Christmas House (see Friday for details). Berkeley Playhouse: The Wizard of Oz (see Friday for details). A scenic 5K run along the Sausalito waterfront starting at 8:30 am ($40 for adults, $25 children under 16). Kids fun run starts at 9:20 am ($5 for kids under 7). There will be a runners' brunch at 9:45 am at the Winterfest Tent (cost $10). Purchase tickets for all events here. Build your own menorah at Home Depot and enjoy Hanukkah treats! Participants receive a free worker's apron. Children must be accompanied by an adult. Location: Home Depot, 111 Shoreline Parkway, San Rafael 94901. Learn more and RSVP. Bring your family to celebrate the season in style at Ramekins' annual Santa's Brunch. Enjoy a welcome pomegranate mimosa, artisan sausage, Wine Country Scramble, made-to-order omelettes, cinnamon raisin French toast, and more. Adults $65, kids $25, 5 and under free. Purchase tickets here. Location: 450 West Spain Street, Sonoma. Event details. Join us for a day-long celebration, accessible for all families. The festivities include Octopretzel Hanukkah songs and puppetry, new Shaboom! videos from BimBam, dreidel games, fabric design art studio, a family Bhangra dance party, and much more! Admission: Free admission for two adults when accompanied by a visitor 18 and under, or a transition youth (18–22). Location: 736 Mission, San Francisco. Event details. This free ocean-inspired event will highlight our most memorable and, to be honest, cutest patients of the year! Guests can participate in a free ocean-inspired interactive program at our hospital’s classroom at noon and 2 pm. The interactive presentation will showcase another record-breaking year at the Center, and guests will get the opportunity to see exclusive behind-the-scenes footage of a days-old harbor seal, touch and feel fur specimens of multiple marine mammals, including a Guadalupe fur seal, and get a closer look at how the Center is helping save the endangered Hawaiian monk seal. Location: 2000 Bunker Road, Fort Cronkhite in the Marin Headlands. Event page. Bring the kiddos for some fun on the ice and a photo with Snoopy. He will be on the ice during the Parents and Puppy Practice and public skating. Free with skate admission. Bring your camera. Location: 1667 West Steele Lane, Santa Rosa. Event details. Local musician Megan Schoenbohm presents songs from her debut album - Bubba & Boo! It's kindie rock fun for the whole family. Free. Location: 375 Throckmorton Ave, Mill Valley. Event details. Looking for a school where you child feels at home, excited to learn and celebrated for what makes them unique? Explore Terra Marin K-8 at its open house. Kids will be kept happily busy with fun activities such as archery and art while parents enjoy a presentation from senior staff, teachers and the Head of School and tour the campus. More info and RSVP at www.terramarin.org. Bring the kiddos for some holiday cookie decorating fun! Come in anytime between 12-3 pm. Self guided instruction. Drop In, get your cookies, and have some fun! Cost: $10 in advance. Pricing includes 2 holiday cookies (star and tree) decorations & icing. Event details. Prokofiev’s timeless tale of a musical narrative of a boy and his animal friends’ bravery is brought to life, with special guest narrator Kathy Najimy. Watch and listen as the San Francisco Symphony Youth Orchestra puts their talent on display, playing a musical fable for the child in all of us. Tickets: $42.5-–$125. Half price for ages 17 and under. Purchase tickets here. Recommended for ages 7 and older. Location: 201 Van Ness Avenue, San Francisco. Purchase tickets here. Princess Willa has everything, until she realizes that the letter W has vanished! People aren’t well—they’re only _ell. And wonder has gone _nder. The Wonderful W tells the _hole story. Gwen Gordon began her amazing career building Muppets for Sesame Street. Free. Location: 51 Tamal Vista, Corte Madera. Event details. Join us for an afternoon of merriment! Santa Claus will be present at 2:30 pm for the children. Please bring clippers and trimmings to make a wreath. Also, bring an appetizer, drink or dessert to share. Main courses of lasagna and and salad will be provided, courtesy of Mauro’s Past & Pizza, Fradelizio’s, Sorella Café, Good Earth, and Ghiringhelli’s Pizza. Thank you to our generous sponsors. Hope to see you there! Event details. We’ll enjoy a quiet walk as the afternoon light fades. This is a perfect spot to look and listen for a few different species of owls. We’ll look for owl pellets and discuss what makes these nocturnal raptors so unique. We request no pets (except service animals) attend. Rain may cancel. If questionable weather, call (415) 893-9527 after 10am on the morning of the event to hear a recorded message if cancelled. No registration is required. 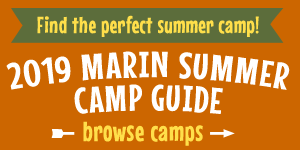 Questions: Contact Shannon Burke at SBurke@marincounty.org or (415) 893-9520. Event details. 900 North Point Street, San Francisco. Event details. Enjoy a delicious buffet dinner, dreidel and other games, menorah lighting, and hot latkes and donuts. This is a free event. Location: Chabad of Novato, 7430 Redwood Boulevard, Suite D, Novato 94945. Learn more and RSVP. The Snow Maiden (see Saturday for details).